CyberLink Power2Go is comprehensive burning software for Windows operating system that able to backup existing discs, erase and copy discs, save and burn disc, create DVD and VCD video discs, and rip or convert audio files. The new CyberLink Power2Go 5.5 is the first burning software that support burning Blu-ray data discs. The software specially designed for novices and experts alike with all the different burning options are easily available from the main toolbar. In addition, CyberLink Power2Go also comes with Double Layer technology that able to burn up to 8.5GB of data, music, and video files onto double-layer discs and offers a complete range of tools for burning different file formats and disc types such as CD, DVD, and BD. Moreover, CyberLink Power2Go has vast support for burning data, supports automatic splitting of files across two discs if the available disc capacity exceeds and offers enhanced security features such password protect and encrypt the entire data discs or partial content. With CyberLink Power2Go 5.5, users can simply copying discs and burning media files with the Windows Sidebar Gadget and drag-and-drop files from the desktop to the Express icons. 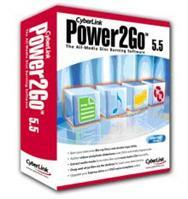 CyberLink Power2Go normally cost $39.95 for purchase. As part of promotional offer from CyberLink, interested users now can get genuine license key with free of cost. This promotional offer applied only for previous version – Power2Go 5.5 LE and not for current version – Power2Go 6 LE. Enter the name and valid email address, then click the “Submit” button. Note: Ignore the message “This event is available from 2008/06/12 to 2008/09/15“. Enter the key when running installed to unlock and enjoy full version product. 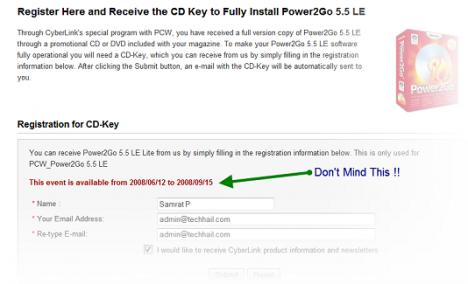 CyberLink Power2Go support Microsoft Windows XP and Windows Vista (32bit).